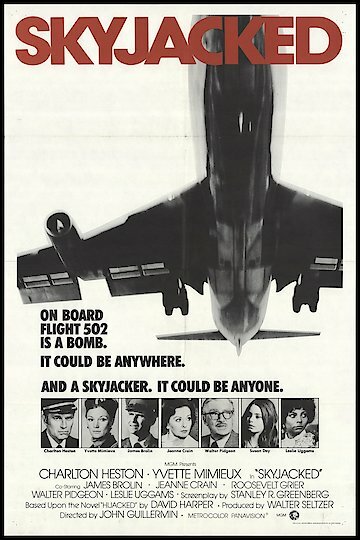 "On Board Flight 502 Is A Bomb. It Could Be Anywhere. And A Skyjacker. It Could Be Anyone." It's a typical trip to Minneapolis, only college girl Ellie Brewster had discovered a bomb threat printed in red lipstick on the mirror of the airline bathroom: "BOMB ON PLANE DIVERT TO ANCHORAGE ALASKA NO JOKE NO TRICKS DEATH." Not long after, a second bomb threat was found in the galley. Captain Henry O'Hara, the pilot, changed course, hoping to avert disaster, flying at a lower altitude than usual. Skyjacked is currently available to watch and stream, buy on demand at Vudu, Google Play, FandangoNow, iTunes, YouTube VOD online.